Robbie Neilson insists that Hearts’ current financial stability means there is no pressure whatsoever to cash in on their prized assets any time soon. The Tynecastle club have made no secret of their desire to develop their own young players, utilise them and then ultimately allow them move on to bigger clubs. 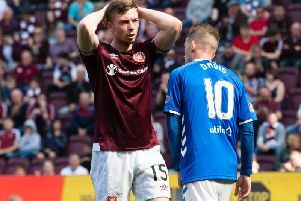 Teenager Jordan McGhee has already been the subject of bids from Ipswich Town, while other academy graduates like Callum Paterson, Sam Nicholson and Jamie Walker are expected to attract interest from elsewhere in the January transfer window in light of Hearts’ strong start to the Premiership season. Prior to emerging from administration in summer 2014, the Jambos were in such a vulnerable predicament that they were effectively forced into accepting any offers for their players, with the likes of David Templeton, Ryan McGowan and Adam King all plundered relatively easily by other clubs. However, at the end of a week when the first set of annual accounts under Ann Budge’s ownership confirmed Hearts to be in rude financial health, Neilson is adamant there is no desire whatsoever to cash in on anyone and that players will only be sold if an offer is deemed too good to refuse. “There were times a few years ago when you would dread the accounts coming out,” said the head coach. “But everyone knows what Ann Budge has done for the club, she’s been fantastic. “Along with the backing of the Foundation [of Hearts], which has been brilliant, that means we can keep hold of players. The fans see the benefits, they get to watch these players for longer – and know that we’ll only accept a substantial bid that can really help the club move forward. “The club doesn’t need the money, so if bids come in and we don’t want to sell them, we won’t sell. If we want to sell, we will. That’s the beauty of it, that we don’t need to sell someone for £100,000 just to balance the books now. “Jordan McGhee is an example, we can keep hold of him. Five years ago, we would have had to sell him by now. But we keep hold of him, he plays more games for us, he gets more experience and we get more use out of him, as well. Neilson hopes to maintain the positivity by notching a fourth successive league win at home to Hamilton Accies today and strengthening Hearts’ grip on second place in the Premiership. This afternoon’s match is followed by games against Dundee and Motherwell before a tricky December sequence in which they face last season’s top four – Inverness, Aberdeen, St Johnstone and Celtic – in quick succession. “I think it will be a difficult one against Hamilton,” he said. “They are a team who compete, work hard, they have a lot of energy. They had a great start to the season and, although they’ve fallen off a wee bit, I still expect them to be competing in the top six.